Batman has always attracted a different kind of fan base than almost any other superhero. What makes him so attractive, I think, is the idea -- maybe not an idea that is verbalized, but certainly a gnawing, lingering, back-of-your-mind idea -- that given the right circumstances and enough will power, you could become Batman. Superman was born on another planet, so that’s not even an option. Spider-Man was bitten by a radioactive spider, another nearly impossible scenario. The Hulk was exposed to massive amounts of gamma radiation, and I don’t even like to stand next to the microwave. Aquaman came from Atlantis, and although I’m a pretty good swimmer and can hold my breath for a reasonably long time, I don’t think I’m ever going to figure out how to telepathically communicate with dolphins. But if I had enough money and determination, I could train myself to become a martial arts expert. I could learn hand-to-hand combat techniques and the secrets of the ninjas. I could become a master detective, honing my observational and deductive skills until I could see things that most people missed. I could pay for the most advanced technology and state-of-the-art tools and vehicles. Add a cool cape and a cowl and a utility belt, and, well, I’m Batman. It could happen. The Batman was first introduced to the world by Bob Kane and Bill Finger in May of 1939 in Detective Comics #27. This was the Golden Age of comic books, and Batman was among the first “superheroes” (notwithstanding his total lack of any super powers), following closely on the heels of the first caped hero to claim super-status, namely Superman. Since 1939, The Batman has been featured in tens of thousands of comic books, newspaper strips, animated cartoons, novels, Saturday morning serials, radio programs, TV shows, and feature-length films. Keeping a character like that relevant is a perennial problem for comic book publishers, because despite the passing of years (and decades), The Batman must of necessity remain somewhat timeless if you plan on selling more comic books to the next generation of readers. So, story lines are interwoven with other story lines, characters are occasionally killed off, new sidekicks and villains are inserted, love interests come and go, and sometimes the origins are reworked and modernized to bring them up to date. Before you know it, your comic book hero is entertaining his third or fourth generation of fans, and there’s more where that came from. So keeping a comic book title fresh and new and relevant is hard work, perhaps impossible work, because the hero has to be immortal on the one hand if he’s going to keep selling comic books, but on the other hand has to be real enough for the fan base to relate and suspend disbelief and keep buying books. In real life, however, people don’t live forever, not even heroes. And movies are not subjected to the same demands as monthly publishing, so a story can naturally have a beginning, a middle, and an end. The movie itself lives forever, readily available to new generations of viewers. There have been a number of franchises where our hero lives to fight another day and film another sequel, although many of those tend to be stand-alone films that simply utilize some of the same characters without necessarily continuing the story line. The James Bond films have successfully cycled through nearly a dozen James Bonds, but the stories are not interdependent. You can watch all the Indiana Jones movies, but if you skipped, say, The Temple of Doom, you’d still be able to enjoy The Last Crusade. But not all action movies are created equal. 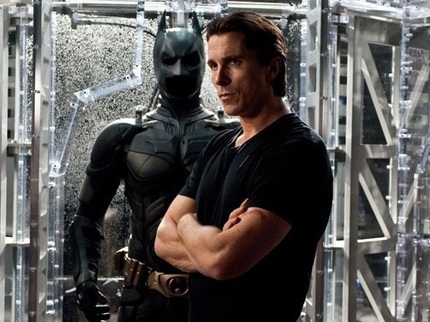 Director Christopher Nolan wrote the screenplay for The Dark Knight Rises with his brother, Jonathan, with whom he had previously collaborated on The Dark Knight. He also co-wrote Batman Begins. With Christopher Nolan behind the camera and the pen on all three films, he was able to masterfully craft a story that brought life to a much-beloved hero and that had a real beginning, a middle, and an end. Because we see the movies as they are released, we see them initially a piece at a time over a period of seven years. Having now seen them all, however, I doubt that I will ever re-watch them without watching all of them at once. This is one story, one volume with three chapters, and it is a brilliant piece of work. Batman Begins obviously deals with the origins of the Caped Crusader, and we see the idyllic world of young Bruce Wayne shattered by a thug’s senseless act. Orphaned, aimless, and wealthy beyond comprehension, we watch the man-child drift in and out of some very dark places, physically and mentally, as he struggles to come to terms with the events and circumstances that have brought him thus far. In his quest for understanding, he finds purpose and direction in protecting the city his parents helped to build. Gotham is overrun with corruption and crime, and The Batman’s brand of vigilantism brings welcome relief to a city collapsing under its own weight. But the weight of his own dual identities is a heavier burden than Bruce imagined, and we come to realize that the battles he fights in the streets are secondary to the battles he fights in his soul. Which identity is his real face, and which is the mask? The Dark Knight reveals a Gotham City where crime is still rampant, but where the tide is starting to turn because The Batman is doing what the police cannot. Enter a maniacal and homicidal master criminal, the Joker, who has set his sights on organized crime and is methodically taking over every criminal enterprise in the city. His genius is rivaled only by his evil, and he proves a formidable and unpredictable foe for the World’s Greatest Detective. Constantly focusing on the Clown Prince of Crime, Bruce allows himself to be more and more consumed by The Batman. A broader picture is revealed, as well, that forces us to question our own humanity, and what separates any of us from the dark side. We see the desperation that drives a good man to do horrible things, and we see flashes of decency and sacrifice light upon individuals judged by society to be unredeemable. And we see Bruce Wayne embrace the darkness to become what his city needs, an anti-hero of sorts, sacrificing himself for the sake of those he has sworn to protect. The Dark Knight Rises finds Gotham City eight years after the tragic death of revered District Attorney Harvey Dent, whose murder has been attributed to The Batman and was the catalyst for a tougher set of laws enacted to give the police the teeth they needed to eradicate organized crime. Bruce Wayne has become a recluse, hardly emerging from his solitary room at Wayne Manor. Wayne Industries is failing because of his neglect, and the Batcave is all but abandoned. With all of the worst criminals now behind bars and serious crime apparently a thing of the past, Bruce has retired The Batman and whiles away the hours, months, and years wallowing in a pool of self-pity and bitterness. Commissioner James Gordon has apparently won the war against crime, but it cost him his marriage and his family. He is also racked with guilt over the lie he continues to live, knowing that the blame for Dent’s death is Dent’s alone, that Dent had succumbed to the very things he had once fought against, and that The Batman had in fact saved Gordon’s son from Two-Face, the depraved monster Harvey Dent had become. Alfred continues his role as long-suffering father-figure and man-servant, and pleads with Bruce to move on with his life, to get a life and live it. The calm before the storm is ended with a brazen and brutal raid in broad daylight on the Gotham Stock Exchange by a psychopathic terrorist mercenary named Bane (Tom Hardy). Bane and his army quickly overpower the city and hold it hostage with a nuclear device. Batman comes out of retirement to face-off against this new nemesis, but he is hardly up to the task. His body is showing the signs of years of abuse from brutal street fighting, and his mind is still clouded from relentlessly reliving the past. Granted, even on his worst day in his worst shape, The Batman could easily take on dozens of average criminals and mop the floor with them. But Bane is no average opponent, and Batman is brutally, savagely beaten until he is nearly dead, his back and spirit broken. Bane imprisons him in a pit from which no one escapes, a prison so horrible and wretched that most men simply succumb to the hopelessness and despair before disease and sickness can claim them. But though The Batman is beaten, Bruce Wayne is not, and he begins a long and painful climb, mentally and physically, to remove himself from this hell-hole and return to defend the city and people he loves. Selina Kyle (the alter-ego of Catwoman, although that name is never used) is played with a cool, calculated smoothness by Anne Hathaway, matching the pitch-perfect performances of the usual cast of characters, namely Christian Bale (The Batman), Gary Oldman (Commissioner Gordon), Morgan Freeman (Lucius Fox), and Michael Caine (Alfred Pennyworth). But even more impressive (if that were possible) is the near-flawless performance of Joseph Gordon-Levitt as Detective Blake, a sort-of special attaché to Commission Gordon who figures out the real identity of The Batman and pleads with Bruce Wayne to come back. Gone is his childish goofiness of 3rd Rock from the Sun days, and gone as well is his boyish appeal in Inception from just two years ago. Gordon-Levitt is a man whose maturing looks match his very impressive chops as an actor. In some respects, he is the heart and soul of this movie, his performance so impassioned and driven that it keeps you anchored in the humanity of this story even when scenes are necessarily so much larger than life. I expect we’ll be seeing a lot of great work from this actor in years to come. Unlike the comic books, this movie treats The Batman as a man, a mortal, who must be subject to the forces of mortality, whose body can only endure so much pain and abuse before it begins to break down. Assuming that someone could actually do the things The Batman does, no one could do them for more than a few years before the toll would be devastating. But what we learn is that The Batman was always a symbol, that anyone could be him. Anyone willing to stand up to the forces of evil and fight, in the dark, against the darkness. It may come as a surprise or even a disappointment to some that Batman doesn’t really get a lot of screen time in this movie. Granted, the movie is nearly three hours long, so there’s plenty of time for everybody, but this movie is less about the mask than it is about the man. Taken as a single installment, it is the least “Batman” of all the Batman movies. Taken as a necessary part of the whole trilogy, it is a masterful conclusion to an amazing piece of storytelling, seven years in the making. This is, in its entirety, a story about a man who seems to have everything and then loses what is most valuable to him. It is the story of his quest to find himself and some purpose for living, a purpose he finds in losing himself in service to those who cannot help themselves. It is a story of fallen heroes, of despair and desperation. It is a story that is born of tragedy and blossoms with hope for a season, before an apocalyptic darkness settles in and all hope seems lost. And it is a story of hope restored and ultimate redemption. The Dark Knight Rises is violent, and it is very dark and at times disturbing. But so is life, and if this trilogy is a reflection of the dark and troubled world we live in, perhaps it is also a reminder that we know how it will end. Good will ultimately triumph over evil. Faith and hope are more powerful than weapons, and selfless sacrifices made for the sake of others are never in vain. Edmund Burke cautioned, “All that is necessary for the triumph of evil is that good men do nothing.” OK, so maybe my boyhood fantasies of becoming The Batman are a little far-fetched. But all of us can do with a reminder that we should be doing something to make our little corner of the world a better place. And if you do that, in my book, you’re a real hero.